Is Your Hair Trying To Tell You Something? 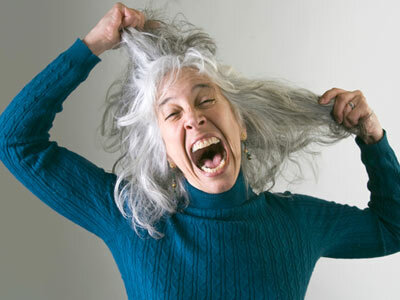 One of the tell-tale signs that you are in the second half of life is your hair goes gray. Because it happens to most people, we think it is normal. But perhaps it’s not. Take a read here from one of our CREST bloggers, Verdeen, a Registered Nurse. This just might change your life (and hair) for the good! I found my first gray hair on my nineteenth birthday. A few decades later, I was finally ready to embrace my new look: Arctic Blonde. But within months of that decision, dark patches began to appear and spread. A new mineral supplement was reversing what I’d thought to be a natural part of aging. It didn’t just change my hair. It may have saved my life. But copper – by itself – won’t fix an isolated body part problem. And it’s not a substitute for hair dye. Copper works together with other nutrients such as magnesium, calcium, folic acid, biotin, inositol, zinc, iodine and B vitamins. It’s a package deal. In fact, it was a very absorbable calcium magnesium supplement that triggered the hair color changes, once the other minerals and vitamins were already on board. There are 16 vitamins, 12 amino acids, 3 essential fatty acids and approximately 60 different minerals essential for health. We are truly formed of the dust of the earth. So how can you tell if your “dust levels” are low? White, gray or silver hair. Beautiful, but dangerous. Cravings. It may not be a will power problem – your body is on a desperate search for survival, hoping to find those missing vitamins and minerals in the next bag of chips. The good news? You don’t need more celery. You need more minerals and vitamins. And when your body gets what it needs, “inevitable signs of aging” can actually fade away – just like my gray hair. Find out why it’s increasingly difficult to get all we need from the 4 food groups here – and what you can do about it.